This is our custom-built Mogami 2319 TA5F Mini 5pin XLR to TS 1/4" for Lectrosonics wireless systems with an instrument. 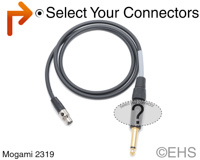 This is a custom cable similar to Lectrosonics MI33PST or MI33PRA passive cable that connects an instrument like a guitar or bass to a wireless bodypack. Construction is Neutrik and Switchcraft connectors with Mogami 2319 cable. Neutrik and Switchcraft connectors are some of the best connectors around. Mogami 2319 cable is very flexible, durable, light-weight cable. For any Lectrosonics pack that uses the TA5 connector, and others. May be compatible with other brands that use the same connector and pinout. *** This is a passive cable that connects to the line input on the pack, most Lectrosonics packs have a 2.7K ohm input impedance on the line in. This is very low for some instruments and will affect the level and tone of the instrument, instruments with active outputs are more likely to better handle this load. Please check with your instrument manufacturer to see if your instrument will work with this. Photo 1 shows 3' cable with Gold TS 1/4" and TA5F and gray shrink label. Photo 2 shows one option for the cable with Gold TS 1/4" and TA5F and gray shrink label.